The call for Justice for the 94 Ukrainian miners has been raised in the UK Parliament by Labour MP’s. Clive Lewis, a leading Labour member of the UK Parliament has called for solidarity with the 94 miners facing court proceedings in the Kirovohrad region of Ukraine. Early Day Motion 709, lodged by him calls for ‘immediate and unconditional termination of the proceedings against the miners’. The Ukraine Solidarity Campaign calls for support for EDM 709 and appeals to members of the labour movement to call on their local MP’s and trade union sponsored MP’s to sign the motion . That this House notes with alarm that 94 miners at the state-owned uranium mine lngulska, in the Kirovohrad region of Ukraine, are facing court proceedings; is concerned that this response to a reasonable protest over months of underpaid wages is aimed at intimidating members of the Independent Trade Union of Miners of Ukraine (NPGU); further notes with concern that the court judge in their collusive conduct with the mine management has violated the Civil Procedural Code of Ukraine; and calls for the cancellation of the next court hearing on 18 January 2018, immediate and unconditional termination of the proceedings against the miners, payment of all wages owed and meaningful negotiations with NPGU. ‘There are are miners in Ukraine who have had no bonus since August and their salary is 231 Euros [per month]. It is important to look at that particularly in light of the fact there are 94 miners going through the judicial process, being prosecuted for what they stand for and it is important when the Ministers stands to his feet to say a word of support about the trial of the 94 miners. The attack on the 94 miners is a threat to the democratic rights of trade unionists in Ukraine. The Inhulska mine is state owned uranium mine in Kirovograd region where the miners were underpaid their wages for months. They demanded a wage increase wages and held a protest underground (after work they decided to stay underground). The management considered this as a strike.On 15 December the first court proceeding in the case took place in Kropivnitskyi. The miners’ union the NPGU represented by lawyer, Anton Zhmurenko, at the trial secured the rescheduling of the hearing on January 18, 2018. At the same time, the miners highlighted the violation the Civil Procedural Code of Ukraine, in discussions about the case between the judge the employer’s representative. They are demanding the disqualification of a judge. 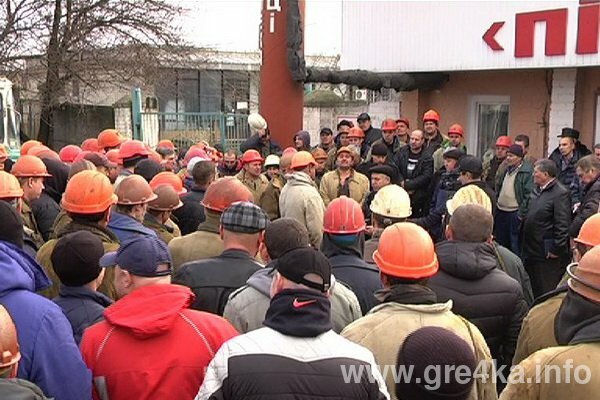 The position of the Independent Trade Union of Miners of Ukraine (NGPU) is that the employer created conditions under which the miners did not receive part of their wages paid as a bonus since August. This depends on the quality of ore. However the quality of ore is not decided by the miners – it is the management who decide where in they mine. The management refused to engage in any meaningful negotiations. After ending their shift, the miners of the 3rd shift went to a place not intended for work (near the lift) and stayed there. They asked for a meeting with the management of the mine to resolve their pay issue and material. The employer didn’t provide the miners with water, meals and necessary medical assistance. The employer blocked people who tried to provide water and food to the miners, who were protesting underground. It was the decision of the employer not to let the second shift work underground. This attack on workers’ rights comes at a time when a draconian draft Labour Code is going through the process of being introduced in Ukraine. The International trade union movement body – the ITUC has condemned it and it is being scrutinised by the ILO.